Nestor laid out, the prophetic declaration. Pollio, governor of Pamphylia and Phrygia during the reign of Decius (249-251), sought to curry favour with the emperor by the cruelty with which he enforced his edict against the Christians. At that time the bishop of Magydos was Nestor, who was held in great respect by Christians and pagans alike. He realized that he was a marked man, but his only care was for his flock whom he sent to places of safety whilst he remained quietly at home to pray for his people and await his fate. He was actually at prayer when he was told that the officers of justice had come for him. They greeted him respectfully, and he said, "My sons, what brings you here?" They replied, "The irenarch and the curia summon you." Thereupon he signed himself with the sign of the cross and, with his head covered by his scarf, he followed them to the forum. As he entered, the whole court rose to its feet as a mark of respect, and he was led to a place apart and seated in a chair while the magistrates sat on stools. The irenarch said, "Sir, do you not know the order of the emperor?" — "I know the order of the Almighty, not that of the emperor," was the reply. "Nestor, give way quietly that you may not be condemned," said the magistrate, but the bishop was inflexible and, when the irenarch warned him of tortures, replied, "The only torments that I fear are those of my God. Be assured that in torture and out of torture Him only will I confess." Regretfully the court recognized that he must be sent to the governor, and the irenarch took him to Perga. Here he was no longer among friends, but his reputation had preceded him, and he was at first urged kindly and courteously to abjure his religion. He firmly refused; whereupon Pollio caused him to be extended on an instrument of torture called the little horse, and as the executioner laid bare his sides and tore them with iron hooks, Nestor sang, "I will give thanks unto the Lord at all times, His praise shall be ever in my mouth." The judge asked if he was not ashamed to put his trust in a man who had died such a death. "Let that be my confusion and that of all who call upon the name of the Lord," was Nestor's answer. 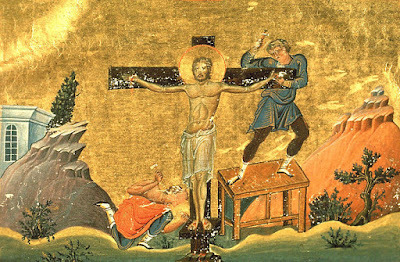 * The least unsatisfactory account of the martyrdom of St. Nestor is that presented in a Latin text printed in the Acta Sanctorum, February, vol. 3. We do not possess the original Greek. The Synaxarion in Greek is a summary. The account presented here is from Butler's Lives of the Saints, "February 26", based on the Latin text.